"Vote for your candidate by placing an ad on the souvenir program. Do not forget to put the name of your candidate on the solicitation letter." how to put an ad in your souvenir program and vote at the same time? 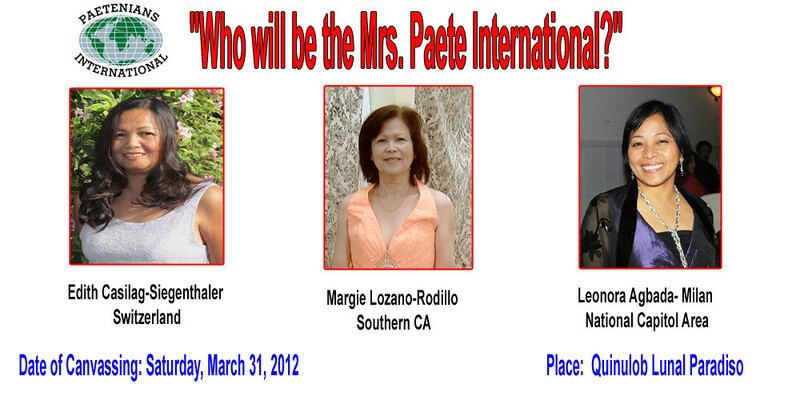 Posted: Mon Feb 06, 2012 5:17 pm Post subject: Organizers..
sa Paetenians International ay magsisilbing vote ninyo. kung sino man sa amin ang inyong napili. Nagpapasalamat po kaming lahat sa inyong malaking tulong. Posting of sovenir solicitation letter to follow. It sounds this is very exclusive to PL subscribers only.Since ordinary paetenians without solicitation letter could not even subscribe nor vote. You can help a candidate in 3 ways. First is by placing an ad in the Souvenir program under the name of the candidate of your choice. The amount depends on the size of the ad. Third is by plain donation with or without the solicitation letter. Please support this Balik-Paete Program, the Sabado de Gloria Ball and the Mrs Paete candidates. The proceeds will help the renovation of the Ermita Church. Furthermore, the candidates also pledged to donate part of their solicitations to the $20 Club which will be used to build additional toilet for PEQMNHS. The solicitation letter will be posted soon. We just need to revise it in fairness to all our candidates before posting. Thank you for your patience, understanding and support. I was informed that the proceeds of the Mrs. Paete candidates will be for the renovation of the Ermita Church. If this is not the case, I stand corrected. But still, let us support this endeavor for the benefit of our town. Proceed for 2012 Beauty Contest is no longer apply to Ermita Kapilya project because Northern California chapter is not involved. Ermita Kapilya is solely and exclusively the project of Northern California Chapter and the Chapter has every intention to finish the project in the future. Whoever is campaigning informing the proceed will go to Ermita Kapilya, please clarify if it is true and what percent of the proceed. They are just using it as a propaganda so that they can encourage more candidates to join and generate more fund. It is the best way to entice people to support, charitable, worthy and noble cause. It is not noted on the flyer posted on USAP. Words of caution and advise: Don’t keep your hope so high that Souvenir Book will be published on time, as they gave false promises. There was an issue regarding the 2009 Souvenir Program of Mrs. & Miss. Paetenians International and Balik Bayan. One of the patrons placed an ad when she was 18 years old, she called the Chapter to follow up and ask for a copy, wondering what is the hold up and reason why it is taking so long to publish. Patron said I already got married, have a kid and until now I have not received one copy of the book for it is almost two years ago. It is funny but that is the truth. See how discomforting and embarrassing from the standpoint of the Chapter who sponsored the event. It is totally unacceptable. But the chapter was able to produce the book at a later date based on second collection of materials provided, and of course with some negative comments. Imagine, two years in the making. The Chapter graciously accepted the criticism. Don’t blame supporters to questions, because of unforgivable experienced. Hope this issue will not occur again. If you have doubt of the promised deadline or delivery, make sure to follow up constantly with the President who spearheaded and organized the event. You have every right to demand. Good luck to each and every one of you for it is worthy cause. What happen to answers provided to questions of candidates regarding publication of sourvenir program and/or books. USAP means communication or media between Paetenians at home and US. Sources of what is happening around the community. All Paetenians Chapters aim to achieve perfection on any fund raising events to help the town where we all grew up. Although we are so far away, we still plan on making our visit to Paete a memorable one. You work so hard to please everyone until you, yourself cannot work any harder. I hope one day, I will be invited instead of sending out the invitations. Thank you all for your continued support and hope to see you again in Paete. The comments above positive and negative are duly acknowledged. If you have not received your copy of the Souvenir Program of 2009 sponsored by Northern California Chapter, please email or call Marina Belen- Treasurer or Jerry Winter- President. They have been very receptive and cooperative regarding this matter. They sent the souvenir program by bulk to different chapters for distribution, some directly to individuals, so they would have not known who did not receive the souvenir program. We will try to do better this time on the timeliness. Please cooperate. Do not be overtly pessimistic. We welcome constructive but not destructive criticsm. Let us have fun. Let us bond together. Pat and Fely, Mayor and Vice Mayor and countless others are working very hard to make this a Balik to remember. wa hapin sa mga taga paetenian???????????? Ay baleng bale ano talagang di pa naaalis yong mga ugaling paete ano? pasensya na Adora talagang ganyan ang ating mga kinagisnan na mga ugali, nangyari din yon sa akin inimbita ako ng katoto pero ng alis ko ay parang damdam na para bang inaasahan na maglagay,ay naku pag ako ang nag imbita di ako umaasa ng lagay,mabuti pa ay mag hotel tulad ng dati.kaya minsan ay di na may balak na umuwi,pero sa easter ay mahalagang sama sama para makita naman yong mga di pasakit ng ulo...kunting unawa talagang ganyan sa atin. baka naman po pwede malaman yung panig ng organizer, kasi kapag nabasa nyo mga post niya sa FB, ang hirap intindihin. concern lang po, sana maayos nyo, habang maaga pa, at maiwasan ang siraan at patutsadahan. In life there will always be 10% that will be against a good deed, thats the way they are, so you have to have a thick skin to go thru this competition which the 10% call it side show, they have no concept that it is for the benefit of our town. We all should be proud that Doc Tabia put up with all of us, he meant well, to give us a goodtime and share the good fortune of few paetenians who succeeded in life. So, bottom line, ignore the 10% non performers, move on have fun enjoy the show, life goes with or without the 10%. Before somebody says i'm trying to gain kudos from Doc Tabia, you will be dead wrong, i dont think he knows me, just so happen that I am a fan on his playing BB days and on his fairness leading the Paetenians Int. Goodluck to all of us. Salamat sa iyo Bb/G. Concern. Nabasa at nalaman na po natin ang dalawang panig at mukha namang walang gaanong malaking isyu kundi isa lamang di pagkakaintindihan. Sana po ay iwasan na ang hindi magandang pagko-koment ng mga madlang mambabasa para hindi na lumala o lumaki. Pare-pareho po tayong taga-Payti, sana ay magkasundo tayong lahat at magtulungan para sa ating bayan. Kumbaga sa sabi na matatanda....magpalabihan o magpasensyahan na lamang!